also referred to as "The City of the Future"
Features: Located on the ocean floor off the coast of Bermuda, within the vicinity of the Bermuda Triangle, Hydropolis was a city enclosed within a transparent dome. Via docking tubes atop the dome, submarines could enter and depart the city. The Aquarium was where aquatic mutations (mutated marine life and/or humans mutated into aquatic beings (including Jeremy) were kept. The Aquarium connected to a tunnel to a pool that allowed Jeremy to exit into the air-filled Hydropolis, as well as to another tunnel that led to an exit-lock from the city. 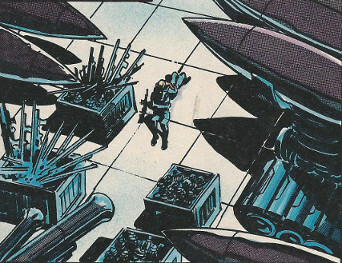 The Armory held a number of rifles, missiles, and other weapons. Sector B-23 held and launched the torpedos. (Hulk#22 (fb) - BTS) <30 years before the main story> - Rypel decided that the surface world had become too spoiled, and that the sea would eventually be spoiled as well. He and his brother, Jeremy, decided to create a new world in the ocean's unspoiled depths. 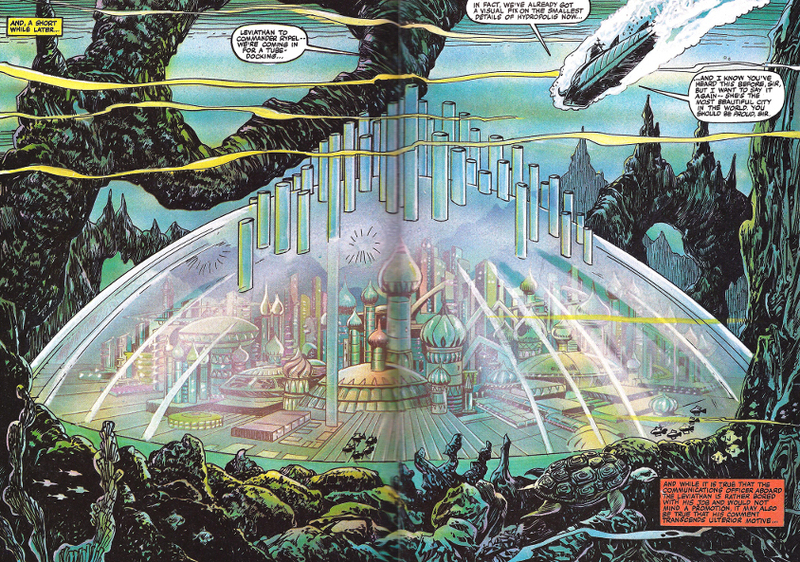 (Hulk#22 (fb) - BTS) - For 30 years, Rypel (and presumably Jeremy) spent untold millions of dollars to create the city Hydropolis on the ocean floor, mining the ocean floor for materials and fishing and cultivating the sea for sustenance. (Hulk#22 (fb) - BTS) - Jeremy and Rypel began to experiment on each other. <According to Jeremy>, Jeremy's experiments made Rypel crazy. (Hulk#22 (fb) - BTS) - Eventually, Rypel transformed Jeremy into an amphibious creature, though his intellect and coherence suffered somewhat. (Hulk#22 (fb) - BTS) - Rypel decided to to destroy the surface society. (Hulk#22 (fb) - BTS) - Rypel planned to destroy North America via a series of charges set on the west coast under the San Andreas fault, and in several spots on the East Coast. A pair of trigger torpedos, one launched at each coast, would activate the charges. The resultant explosions would split the crust and sink huge portions of the continent. The USA was to then misguidedly retaliate against the Soviets (see comments), with escalations destroying the rest of the surface societies in World War III. (Hulk#22 (fb) - BTS) - Leviathan swallowed a series of boats, and brought them and their passengers -- totaling 23 kidnappees -- to Hydropolis. (Hulk#22 - BTS) - The Leviathan swallowed a small boat containing the drug smugglers Creach and Simons. (Hulk#22 (fb)) - Leviathan returned to Hydropolis, and Rypel was informed that they had captured a pair of drug smugglers. (Hulk#22) - When Rypel announced that they would destroy the surface world tomorrow, Garver argued that their numbers were far too few to cut themselves off from the outside world, but Rypel returned that they really only needed two, an Adam and an Eve, and they already had their Adam (Jeremy). When Garver wondered whether Rypel had told him yet, Rypel explained that he felt it was better if his brother did not know: Without sharing the guilt, he would be better able to look to the imperatives of the future. The discussion was interrupted when Messenger reported that the storm currents had shifted the north mooring plates, disloding and possibly damaging one of their charges. Unwilling to take chances so close to their plans, Rypel ordered that the charge be expelled immediately and sent as far from there as possible. When Garver stormed off to inform Jeremy, Rypel fatally shot Garver in the back of the head. Ten minutes later, the nuclear charge was fired. 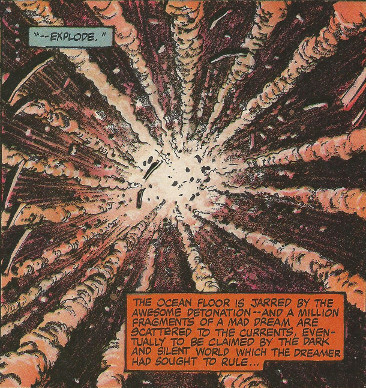 (Hulk#22 - BTS) - Eventually, three miles offshore from Bermuda, the torpedo armed with nuclear charges struck the coral reef and detonated, and the resultant shockwave led to a hurricane-like circular water surge. This caused a massive wave to strike the shore of Bermuda, where Bruce Banner was enjoying a therapeutic vacation with Dr. Sheila Marks. 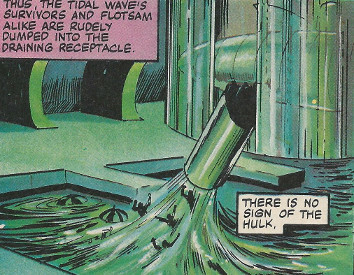 (Hulk#22 - BTS) - Soon after, Leviathan captured the people from Bermuda left floating off shore by the wave, including the Hulk, who it subdued electrically. 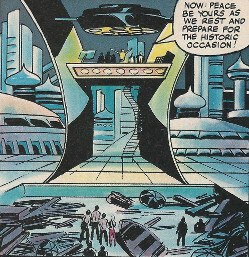 (Hulk#22 - BTS) - Hoping to incorporate the Hulk's strength, toughness, and endurance into his experiments, Rypel ordered the crew to bring their newest abductees to Hydropolis. (Hulk#22 (fb) - BTS) - Shortly after his capture, the Hulk reverted to Banner. 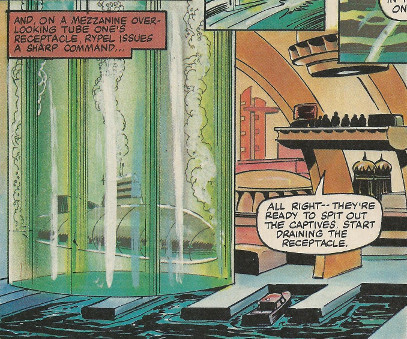 (Hulk#22) - Leviathan arrived at Hydropolis, and the crew sent the submarine containing the captives down Docking Tube One. The captives were then released, and Rypel was distraught to find the Hulk absent until one of his technicians explained that he had probably reverted back to his normal form. Rypel then introduced himself and detailed his plans. After Rypel left them, Banner and Marks convinced one of the other captives to provide a distraction, yelling and ripping open his shirt; this made the guards think that man was the Hulk, so they knocked him out with plans to bring him to Rypel. With the guards thusly distracted, Banner and Marks climbed out of their chamber to investigate the rest of Hydropolis in hopes of thwarting Rypel's plans (Banner noted that if Rypel's plan succeeded even 10%, the losses would be horrific). They then ambushed a pair of guards and took their uniforms, after which they split up to search; Banner investigated the aquarian and encountered Jeremy, who came out to meet him and assumed him to be one of the new researchers. 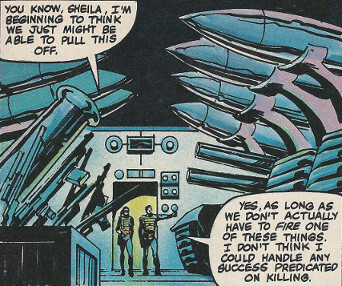 Meanwhile, Sheila infiltrated a technician squad and attended a mention wherein Rypel outlined his specific plans to destroy America. Banner then met back up with Sheila. She broke into the torpedo housing facility via a hairpin (impressive security! ), and Banner altered the torpedos' electronic homing systems to cause the torpedos to alter course and target Hydropolis shortly after being launched.. They then broke into the armory (via another hairpin), took an hour to rest, and then each grabbed a machine gun (though both hoped strongly they wouldn't have to actually fire the weapons). Sheila returned to the site where the other prisoners were being held, and she bluffed the guards into dropping their weapons. Following Sheila's lead, some of the prisoners stayed behind to tie up the guards, while the others followed Sheila to the armory to grab some weaponry with the plan of taking over Hydropolis. Banner returned to the aquarium and urged Jeremy to come with his quickly, as he didn't have time to explain. Despite his mental haziness, Jeremy realized Banner was not one of his brother's researchers and wondered who he was. After the torpedos were launched at Rypel's command from sector B-23, Sheila and the other escapees rushed in, explaining that the torpedos had been sabotaged and that they had to escape in a submarine within 10 minutes. Unwilling to give up on his plans, Rypel fled. As none of the former prisoners were willing to shoot Rypel, Sheila instead guided them to round up the technicians and get to the subs. As Banner tried desperately to convince Jeremy to trust him, Rypel rushed in and -- warning of the threat to the creation of a new race of intelligent life -- told Jeremy they were now prisoners, and that Jeremy must kill Banner. As the confused Jeremy advanced on Banner despite his warnings, the stress caused Banner to turn into the Hulk. The two struggled and, even in the water into which they eventually ended up, the Hulk easily overpowered Jeremy. Recalling anger-therapy recently used to calm himself by Sheila, the Hulk convinced Jeremy that he should re-direct his anger towards Rypel, the one who really wanted to hurt him. Admitting he could now see that his brother was at fault, Jeremy got out of the water, and told Rypel that while he could not think right anymore, his own experiments on Rypel had also failed, driving Rypel crazy. Despite Rypel's denial and pleas they they were brothers, Jeremy wrapped his hands around his neck and strangled him. Meanwhile, Sheila and the freed prisoners rounded up Rypel's crew, and one of the former prisoners admitted to having been in the Navy and thus possibly able to pilot the sub. However, while they got into and sealed the submarine within one of the docking tubes and then filled the tube, the Navy man found the controls too advanced and worried -- as the torpedos returned per their programming -- that it might take him hours to firgure them out. Jeremy lamented having apparently killed his own brother, but the Hulk told him the place was going to blow up and then pushed Jeremy back into the pool and told him to escape. After Jeremy thanked him and departed, the Hulk wondered whether Jeremy would make it, and then he made his way to the submarine. Remembering Sheila as the one who had helped him before, the Hulk agreed to help; per Sheila's request, the Hulk hurled the submarine out the tube, and it passed between the approaching torpedos. The Hulk could not escape before the torpedos struck, destroying Hydropolis, and the shockwaves propelled the submarine upward. The Naval man then got the sub's controls working -- he was uncertain whether he had figured them out or they had been previously jammed by Hydropolis' systems -- and brought the sub to the surface. (Hulk#22 (fb) - BTS) - The Hulk survived and was propelled to the surface. He reverted to Banner near some fragments of Hydropolis. (Hulk#22 - BTS) - While the freed prisoners planned to inform the US Coast Guard about Rypel's planted charges, they were relieved to see Banner floating -- exhausted and moaning in delirium -- alive. Comments: Created by Doug Moench, Ron Wilson, and Alfredo Alcala. I sadly pulled the central 4 pages from my issue of the rare Hulk magazine to review and scan these issues, so I hope you enjoy the related profiles. Comics are meant to be read and enjoyed! Of course, when your children are ready to sell your collection, they may not appreciate that! Bermuda Triangle...In the early days of the Appendix, I did a profile focusing on the Bermuda Triangle time warp associated with the series Skull the Slayer; it needs a major update/overhaul, but it does discuss many of ther other characters/events associated with the Bermuda Triangle. Rypel refers to the Soviets in his plot. Per the bibliography for the Hulk in World War Hulk: Gamma Files, Hulk#22 took place -- along with multiple other adventures -- between Incredible Hulk#244 and #245, which were published in 1980, which would amount to occuring something like 7 years ago "Marvel time." Working from 2016, that would put Rypel as having started his plans around 1979, which was well before the collapse of the Soviet Union, and Rypel just -- ensconced in his undersea society -- didn't take note of the change and refer to it as Russia in the main story; but, eventually, the sliding time scale will make that problematic. Even when the timescale slides forward far enough (around 2028, where Rypel's 30 years of planning would have started around 1991), Rypel's a kook and could just have referred to the older name...or, you could take it as a topical reference. Thanks to MarvellousLuke for putting together and cleaning up the two page spread that makes up the main image! other aquatic bases or Hydro characters, beings, etc. Garver was an advisor and/or scientist involved with Hydropolis. (Hulk#22) - When Rypel was pleased as drug smugglers would not be missed and thus would be perfect subjects for experimentation, Garver countered that there had been too many hits lately for his taste, and that they were just attracting attention to themselves with all of the disappearances they had caused. Reminding Garver that this was why their location in the Bermuda Triangle was so perfect, Rypel nonetheless assured him that this would be the last boat they would capture, as he had decided that they would make the break tomorrow. Garver argued that their numbers were far too few to cut themselves off from the outside world, but Rypel returned that they really only needed two, an Adam and an Eve, and they already had their Adam (meaning Jeremy). When Garver wondered whether Rypel had told him yet, Rypel explained that he felt it was better if his brother did not know: Without sharing the guilt, he would be better able to look to the imperatives of the future. Garver countered that this would be better for Rypel but not for Jeremy; however, when Garver threatened to act to prevent this, they were distracted when Messenger reported that the storm currents had shifted the north mooring plates, disloding and possibly damaging one of their charges. Unwilling to take chances so close to their plans, Rypel ordered that the charge be expelled immediately and sent as far from there as possible. Garver argued against this, worrying of the consequences if the charge detonated, but Rypel told him it didn't matter, as all of the other charges had been set, and tomorrow they would be triggered into a chain reaction; by the time the authorities investigated one random open sea detonation, it would be too late. 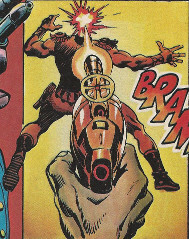 Garver stormed off, stating that if Rypel wouldn't tell his brother, he would; but Rypel fatally shot Garver in the back of the head with his high-tech pistol. He then ordered Messenger to remove Garver's body on his way out and to expulse the nuclear charge as ordered. Messenger seemed to be a member of the regular crew involved with Hydropolis. 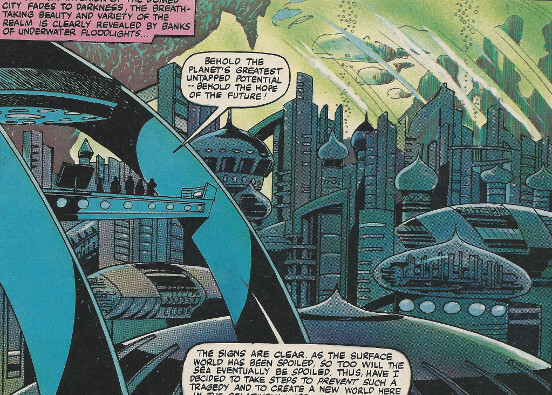 (Hulk#22) - Messenger reported to Rypel that the storm currents had shifted the north mooring plates, disloding and possibly damaging one of their charges. Unwilling to take chances so close to their plans, Rypel ordered that the charge be expelled immediately and sent as far from there as possible. Garver argued against this, worrying of the consequences if the charge detonated, but Rypel told him it didn't matter, as their plans were too far along to be stopped at this point. Garver stormed off, stating that if Rypel wouldn't tell his brother, Jeremy, he would; but Rypel fatally shot Garver. He then ordered Messenger to remove Garver's body on his way out and to expulse the nuclear charge as ordered. Hydropolis had at least 60 residents, including Garver, Jeremy, Messenger, and Rypel (you can see frontal images of the crew in these). This presumably includes the crew of Leviathan. The rest of the members were involved in research, maintenance, and/or served as guards/soldiers. Those serving as the latter carried rifles of some type. The foreground of this image features Dr. Sheila Marks, who was not actually a member of the crew, but -- with Banner -- had taken out a pair of the crewmen and put on their uniforms so they could move about Hydropolis and investigate without interference. Banner in uniform can be seen in the Aquarium image. The crew were involved in most of the activities involving Rypel and/or Hydropolis, so I'd direct you to the main profile for a more detailed history. The Aquarium contained a number of animals that seemed to have been mutated via experimentation by Rypel and/or Jeremy and the other researchers. Following his mutation, Jeremy found he could exist indefinitely underwater and, as his intelligence faded, he spent much of his time in there. The Aquarium had a tunnel that connected to a pool through which Jeremy could access the non-aquatic portion of Hydropolis, and the pool also contained a tunnel to an exit-lock through which one could depart Hydropolis. Banner arrived at the Aquarium while investigating Hydropolis. Though he found it both fascinating and beautiful, he dismissed it as insignificant until he saw Jeremy swimming within, after which Jeremy exited via the pool and greeted him. 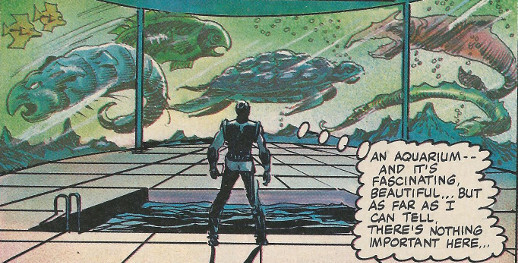 Later, Banner returned to the Aquarium to try to get Jeremy to come with him and escape before Hydropolis was destroyed. Rypel arrived and goaded Jeremy into attacking Banner, who became the Hulk and convinced Jeremy that Rypel was the true enemy. The armory contained Hydropolis' weapons. These included various types of rifles, missiles, and mobile missile-launchers or tank-like treads. Sheila Marks and Bruce Banner found the armory, and she used a hairpin to pick its lock(!). They took rifles to help free the prisoners from the guards. Sheila and Bruce also rested for an hour here before embarking on their missions to free the prisoners and save Jeremy. Sheila then led the freed prisoners back to the armory to arm themselves to overthrow the crew. The armory and its contents were presumably destroyed along with the rest of Hydropolis. Docking Bay One was at the base of one of what looked to be like 36 docking tubes from which someone could enter Hydropolis from the outside sea. The tube continued down to a drainage receptacle. Leviathan would release its submarine -- containing the captured people, ships, and surrounding water and debris picked up by Leviathan -- and the submarine would enter the tube associated with Docking Bay One. The tube emptied onto the drainage receptacle onto which the submarine's contents were dumped. The drainage receptacle allowed the water to drain away, so the people and materials could be recovered and contained. There was also a Mezzanine, from which Rypel and others could supervise arrivals, and from which Rypel could introduce himself to the newest captives. Sector B-23 contained the torpedo launch equipment and controls. The torpedos were programmed to strike pre-programmed charges along the east and west coast of America intended to destroy the continent. When storm currents, shifted the north mooring plates, disloding and possibly damaging one of their charges, Rypel had that torpedo expelled immediately and sent as far from Hydropolis as possible. The torpedo carrying this nuclear charge detonated against coral off of Bermuda's shore, causing a massive wave that crashed on Bermuda's shore, pulling numerous people -- including Bruce Banner and Dr. Sheila Marks -- out to sea, where they were captured by Leviathan. Sheila Marks and Bruce Banner found Sector B-23, and she used a hairpin to pick its lock(!). Banner reprogrammed the torpedos to turn around and target Hydropolis several minutes after being launched. As planned, the torpedos returned and struck Hydropolis shortly after the former prisoners and the crew escaped aboard a submarine. The base was destroyed. Creach and Simons were apparently a pair of drug smugglers. As they passed through the Bermuda Triangle, Simons taunted Creach about being afraid of passing through the area. Both were surpised when the massive Leviathan surfaced and swallowed their boat. They were apparently brought back to Hydropolis and imprisoned, with the intent of serving as subjects for experimentation. As Hydropolis was destroyed the next day, it seems unlikely that Creach & Simons had undergone experimentation, but it is possible. Otherwise, it would seem most likely that Creach & Simons escaped Hydropolis aboard the submarine with the others shortly before Hydropolis' destruction. Their craft, however, did not go with them. We don't know for sure whether their boat ever left Leviathan; I don't think whole boats were kept within Leviathan's submarine, but we don't know for sure what happened to the boats when their occupants were transported to Hydropolis. All other characters mentioned or pictured are &trade; and � 1941-2099 Marvel Characters, Inc. All Rights Reserved. If you like this stuff, you should check out the real thing!